Japanese Episode AG 168: "The Big Number One! Haruka vs. Takeshi!!" American Episode 438: "What I Did For Love!" Haruka is now in Aberia Town, training for her upcoming Contest. She decides to use Eevee for the first time, so she works with her newest pokemon to get it ready. While training, Eevee surprises everyone by revealing that it can use Dig attack! As everyone wishes the pokemon good luck, the group is approached by a Pokemon Breeder and former Grand Festival winner, Yuma. 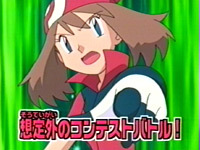 The young lady was attracted to the group by Takeshi's Usohachi, who she says is exceptionally well-trained. After talking with the former Gym Leader for a bit, Yuma gives a suggestion that Takeshi enter the Aberia City Pokemon Contest! Takeshi agrees and signs up right away, much to everyone's surprise. The Contest day arrives, and Takeshi's Usohachi is able to impress the judges in the Appeals round by juggling baseballs with its Flail attack. Haruka, surprised by how good Takeshi is, goes on-stage with her Zenigame and wows everyone with some bubble / ice combinations. After the first round, it is revealed that both Haruka and Takeshi have made it to the second round! The two friends continue to progress through the Contest, eventually facing each other in the finals. Takeshi's Numaclaw faces off against Haruka's Eevee, and for a while Takeshi's pokemon has the upper hand. However, Haruka is able to turn the battle around and is able to chip enough points away before the time limit is up to pull through with a victory. Now that Haruka has won, she has her fourth Contest ribbon! With only one more ribbon to go, Haruka anxiously anticipates her next Kanto Pokemon Contest. This episode was great but terrible at the same time. It was great because we get to see Takeshi in a Pokemon Contest. We get to see him do a Kyojin no Hoshi parody. We get to see him hit on Lillian, mid-Contest. And we get to see him not only battle, but do a really good job at it. Takeshi knows a lot about pokemon battles and has been on the show a very long time, so it's nice to see him battle like the pro we know he can be. And then we have Haruka. Her Eevee, like other pokemon before it, just happens to learn an attack right before the Contest (this time, it's Dig). She makes us sit through the zillionth Bubble Beam and Ice Beam combination. But the worst part of this episode is the bullcrap victory she pulls out. Numaclaw absolutely mops the floor with her for the first half of the battle, yet Eevee is able to win by walking on top of a Water Gun (???) and tackling its opponent a few times? It's probably the worst bullcrap ending we've seen Haruka earn, and with this character, that's saying something. Dubbed Yuma makes Sarah's Ash sound hyperactive. What is it with the voice actors in this show and their lack of emotion? Are they already bored with it? Arbok and Livolt keep their Japanese voices. During the part when the battle unfairly turns in Haruka's favor until she's awarded the winner, Watashi, Makenai ~Haruka no Teema~ can be heard. This is removed from the dub because Japanese singing = evil. Or something. Three seconds are added to that TO BE CONTINUED... screen.